Like many of you, I’ve been curious about what’s up with 31-05 34th Street—the old Bugatti restaurant, which had a lot of, let’s just say, problems. It closed probably end of last year, and has had a lot of activity going on inside over the past few months. We decided to see what we could find out and I was happy to sit down yesterday with the new owners and have a chat about what’s coming. Bottom line—I’m excited! 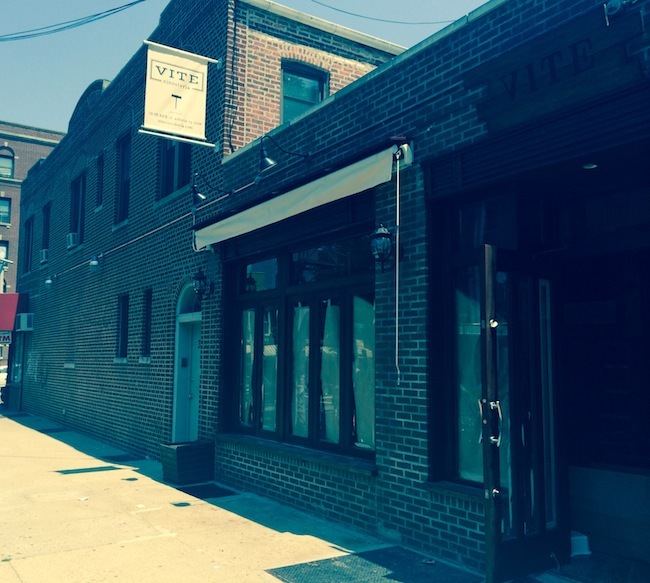 The new restaurant will be called Vite Vinosteria. 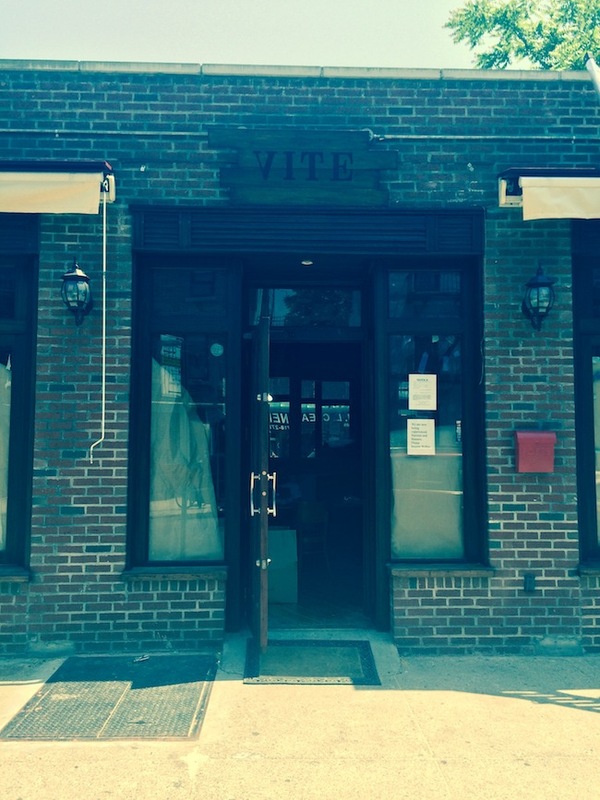 Vite refers to the use of a corkscrew and a vinosteria is a wine bar. It’s going to be run by people who were born and raised in different parts of Italy, and I spoke with two of them, Pinuccio Uras and Carmelo Bennici, who come from Sardinia and Sicily, respectively. Between them they have decades in the restaurant industry, primarily with Cipriani, so they really know what they are doing when it comes to running a restaurant. They plan to offer Neapolitan-style pizza, foccacia, homemade pasta, some meat dishes, seasonal produce, and a variety of small plates including cheeses and meats. They’ll have a full liquor license, which means Italian wines and spirits, among other things, and that also means the Aperol Spritz, one of summer’s most beautiful cocktails, will be available. They’re also considering bringing over the Cipriani Bellini, too. Look for wines served by the glass, carafe, and marzianetto, which is a 2 oz glass. This makes sampling different wines (wine flights, anyone?) pretty easy. Desserts are also in the plans, and all will be made in-house. You can have an espresso too, made with Costa D’Oro coffee. It was fun to talk about the pizza, which the chef hopes to make with a special flour made from wheat grown in Canada. They say the texture of the dough is light and beautiful and will do well with the rising schedule for both the naturally fermented pizza dough and foccacia—48 hours. This makes for a more digestible and flavorful dough. Pizza will be cooked in a gas oven. Another bread item they plan to offer is pane carasau, a specialty of Sardinia. It is also known as carta musica, because it is very thin, like the parchment paper used for music scores back in the day. This flatbread is baked for just a few minutes and delicious topped with a little olive oil and salt, maybe with a bit of rosemary. And speaking of rosemary, they are hopeful that they can use the roof to grow herbs and a few kinds of vegetables. They are very much in favor of creating a seasonal menu, so expect to see changes every few months or so. Some of the things you can expect to find on the menu are arancini, meatballs, and bacalao (salt cod) both whipped and formed into croquettes. One particularly delicious sounding dish is house-made buckwheat orecchiette with lamb ragu (also gluten-free). There will be 3-4 specials each day, which will likely feature regional dishes from around Italy. And desserts range from classic tiramisu to popcorn mousse with a brandy sorbet; they’ll also be making a few flavors of gelato each day. As you walk into the vinosteria, there’s a bar on the right that has 6-7 stools. The floors are covered with hardwood, the ceiling’s beams a rich brown color, there are large wooden-cased mirrors on the walls, and the north wall has exposed brick. On the south end, where the bar is, also has mirrors on it, and a retractable TV will be installed to show Italian sports matches. You’ll even be able to pick up an Italian newspaper there while you enjoy your meal. The space will accommodate 36-40 seats, and if they get their outdoor cafe permit, that could mean another 30 seats. Hours are expected to be 5 p.m. to 1 a.m., perhaps open a little later on Friday and Saturday. Good chance they will be open for business mid-June. 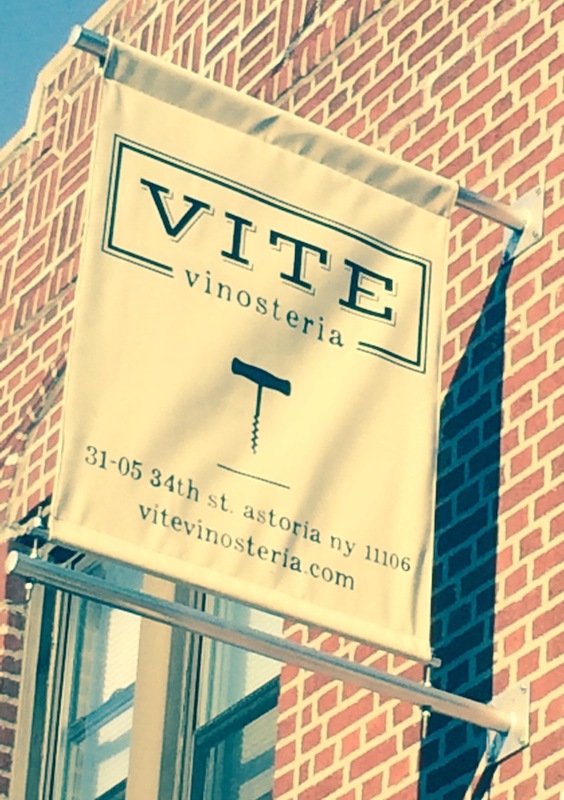 The owners hope Vite Vinosteria will be a nice, relaxing spot in Astoria, where you can come in and have a drink and a nice bite to eat, a place to feel comfortable and chill. We think they are going to do an amazing job at this and can’t wait to check it out when it’s open!